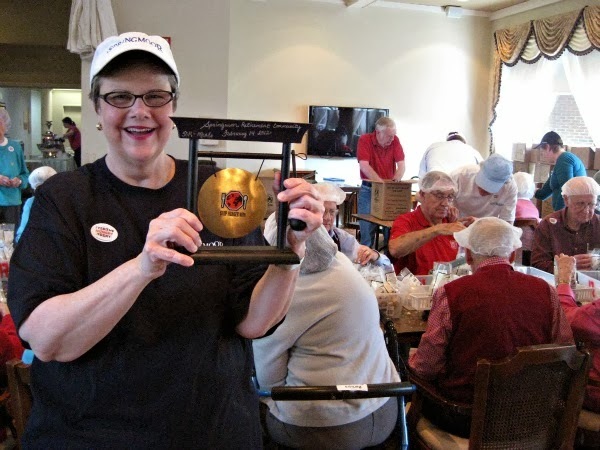 Springmoor Life Care Retirement Community is gearing up for Stop Hunger Now, a meal-packaging program that will aid international hunger-relief efforts. Feb. 14 marks the third year that Springmoor residents will host a Stop Hunger Now event. “This is the third year we hosted Stop Hunger Now on Valentine’s Day because it is Springmoor’s way to give our love back to the world,” Springmoor Chaplain Phyllis Mayo said. For Stop Hunger Now, Springmoor residents and staff package a combination of rice, soy, dehydrated vegetables and vitamins into meal packets that will then get distributed internationally to areas that combat starvation. The meal packets cost roughly 25 cents to produce and will go all over the world. Each year, Springmoor sets a goal for the amount of money they want to raise for Stop Hunger Now. In the past several years, the volunteers surpassed their goal by thousands of dollars. “The first year we set our goal at $4,000 and raised $8,000. Last year, we set our goal at $10,000 and raised $14,000. We expect to exceed that goal again,” Mayo said. In addition to the meal program, Mayo collects money donations from residents to provide more support for the Stop Hunger Now initiative. Springmoor residents raise all the money for the foods they package. Formed in 1998, Stop Hunger Now works to globally distribute food and relief aid. In 2005, the organization launched the meal-packaging program, in which volunteers can donate their time and resources to assemble food packets for the organization. Residents and staff at Springmoor look forward to their experiences at the Stop Hunger Now fundraiser. Stop Hunger Now is based in Raleigh, N.C, allowing Springmoor residents to participate in a locally-based cause that will impact children and families around the world. Springmoor Life Care Retirement Community is a full-service retirement community in Raleigh, N.C. To learn more about Springmoor, check out our website, and find us on Facebook.